So now it’s official: Aaron Heilman is in the bullpen, supposedly for the good of the team. I don’t buy it. How is this good for the team when you have Zambrano and Trachsel still in the rotation? I understand the Mets’ need to make up for the Kazmir deal and keep throwing Zambrano out there until he finally “gets” the 10-minute tutoring received from Rick Peterson. What I don’t understand is how and why Trachsel still has a job. Yesterday, Willie Randolph was quoted as saying something to the effect of, the players know they need to do what’s best for the team, and Aaron may be unhappy but he’ll be fine with the decision because he’s a team player. Well if that’s true then again, why is Trax still on the roster? Last year he downright refused to go to the bullpen when he returned from back surgery. With the Mets already set with five starters, was that best for the team? I have no problem with Brian Bannister being the #5 starter; in fact, I applaud it. The problem I do have, is with Zambrano and Trax #3 and #4. Get Trax out of there and insert Heilman; better to do it now than in June, when Trax is 1-8 and has re-busted his back. 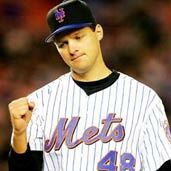 Many of the fans posting on the Mets blogs are asking what the Mets owe Heilman … my question is, what do the Mets owe Tracshel? The guy is a career loser, never better than a #4 when 100%, and now 35 and coming off back surgery. Some of the same fans are saying that Heilman’s best role for the team is to be in the bullpen because he was so dominant there last year as a setup guy in the late innings. Well guess what? That’s Duaner Sanchez’s role this year. So when does Heilman come in? The 6th? But isn’t that where Bradford, Heath Bell, and Jorge Julio will be? You wouldn’t need all these damn relievers if you had starters who could go more than 5 innings. I think Heilman has the guts and ability to be a 6-8-9-inning pitcher, if given the chance. But of course, the naysayers point to the fact that Heilman is a two-pitch pitcher, and batters hit him after he goes through the lineup two or three times. Nonsense. First, he’s a three-pitch pitcher; he throws a slider that he didn’t need in relief outings. Second, even if he was only a two-pitch pitcher, there have been very successful starting pitchers in the past with just a fastball/changeup arsenal. Mario Soto, Tom Glavine immediately come to mind. Finally, I think every lineup in the big leagues is going to hit better against a starting pitcher in the third and fourth go-around. And I’ll take my chances with Heilman in a second, over Trachsel and Zambrano. Unfortunately, Heilman is in a difficult predicament. If he continues to pitch well, coming out of the bullpen, the Mets will further feel justified in their decision and keep him there. If he pitches poorly, he may never get another chance to start. My greatest fear is this jerking back and forth injures his arm, and we won’t see him pitching anywhere. Let’s just hope he doesn’t become the next Tyler Yates or Grant Roberts, and be out of baseball due to arm problems by 2008. I’d rather see him anchoring the starting rotation, with Bannister, Pelfrey, and Humber right behind him.